This recipe is barely adapted from a recipe in Annie Rigg’s Sweet Things, a gorgeous book that would, as this is front of everyone’s mind in December, make the perfect Christmas gift. As would the recipes which fill its pages, the kind of sweet shops treats reserved for gifts and special occasions. I wanted to make something simple for my publisher as a present to thank them for all their hard work this year, and cubes of fudge felt like they’d fit the bill. 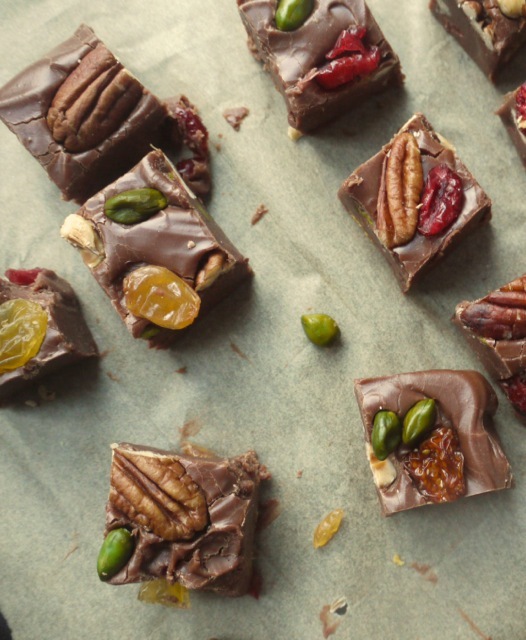 Jazzed up with handfuls of dried figs and hazelnuts, pecans, golden sultanas, cranberries and pistachios for pops of colour, this is the kind of sweet festive treat I’m as happy giving as receiving. If you don’t have a sugar thermometer, please invest in one now. For some reason people think they’re complicated or find them scary, but it’s no less vital than a digital scale if you’re keen to try making your own sweets. Granted all that bubbling sugar is a little bit alarming, but add a deep-sided saucepan to your shopping list and you’re pretty much set. 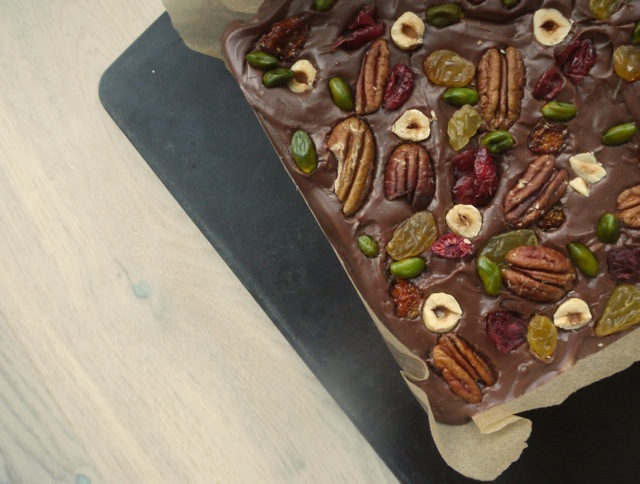 This fudge is rich and chocolaty, smooth and creamy (rather than the grainy sort) and infinitely adaptable. Try adding chopped stem ginger as Annie does in the original recipe, fold in crushed up ginger nuts or bits of Oreo or keep it simple without any add-ins at all. 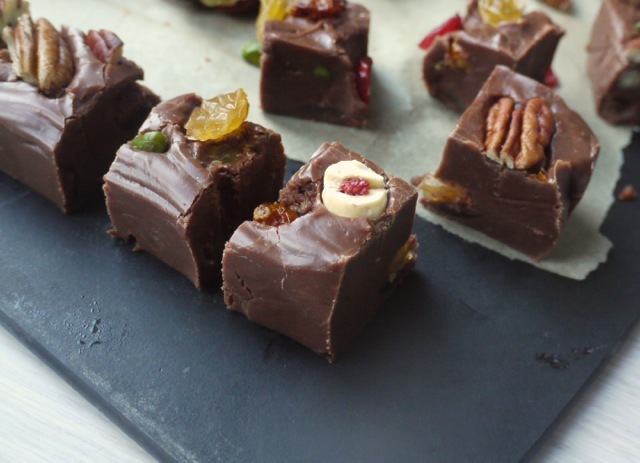 Deeply chocolaty fudge packed with Christmas flavours. Grease an 18cm square loose bottomed tin with sunflower oil and line with baking parchment. In a large, heavy bottomed saucepan, combine the evaporated milk, milk, double cream and salt and place over a medium-low heat to dissolve the sugar. Once dissolved, bring to the boil then cook, stirring regularly, until the mixture reaches 112 degrees C/233 degrees F on a sugar thermometer. Once the mixture comes to temperature, remove from the heat and add the vanilla, chocolate, 85g mixed dried fruit and nuts, butter and cocoa. Stir gently to combine. Spoon the fudge into a bowl and leave to cool for 3 minutes, then beat with a rubber spatula until it thickens and starts to lose its shine, 1 - 2 minutes. 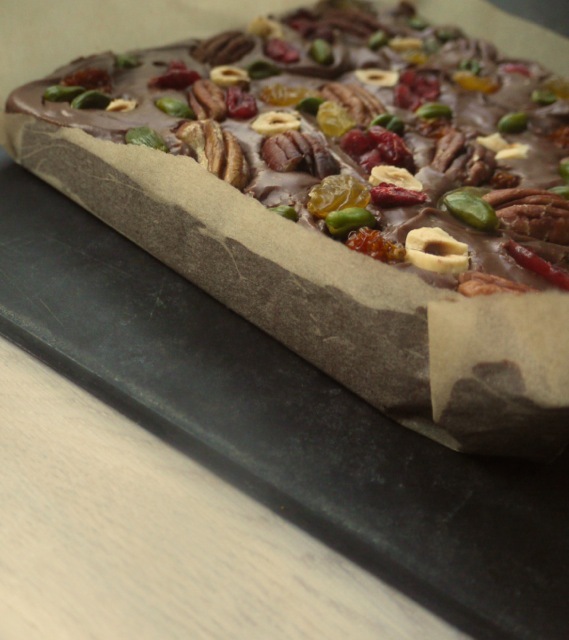 Spoon the fudge into your prepared tin, level flat and press in the remaining fruit and nuts. Leave to cool completely at room temperature, until firm, then cut into cubes. Will keep in an airtight container for up to 2 weeks. 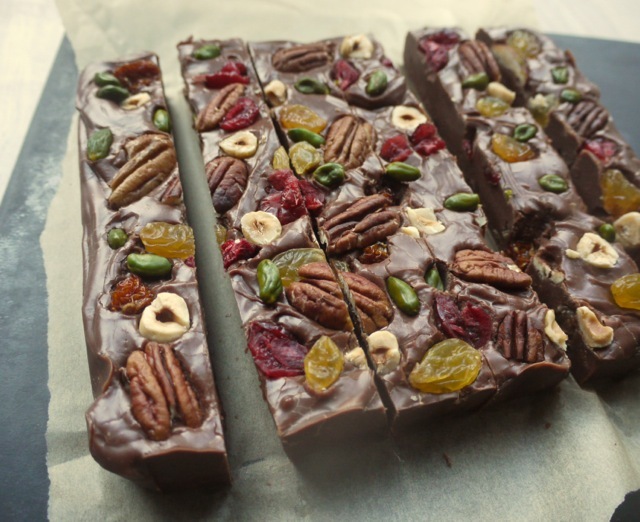 Adapted from 'Chocolate and Stem Ginger Fudge' in Annie Rigg's Sweet Things. I’m afraid I don’t put cup measurements on my blog as using a digital scale is so much more accurate. They’re inexpensive and well worth investing in! Thanks for the recipe! I was wanting to make fudge for my family as a gift but couldn’t find a recipe I like. This recipe is exactly what I was after. It looks delicious! Merry Christmas. It’s definitely not too late!!! I loved the look of this and made it this morning. I followed your instructions to the letter, and used digital scales and a sugar thermometer, but it didn’t thicken and set. It is delicious as a gooey, runny, chocolatey, fruity, nutty treat (which I have eaten far too much of!) but it isn’t fudge, even after some time in the fridge this afternoon. I will have to try again for presents! Is 112 degrees Celsius correct! Should I have boiled it at that temperature for a set amount of time? Thank you. I actually beat it with the spatula for 5 minutes because it took a while to thicken. But it clearly still did not thicken enough. I thnk my thermometer is OK but will check. If I make another batch I will update you. I have successfully made a fair bit of fudge, toffee and other sweets before so it is rather strange. But these things happen! 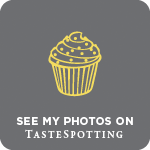 I just thought you would like to know and I will be interested to see if your other readers have any problems. Happy Christmas. I am pleased to report that my second batch was successful. I must have had a false reading before, possibly in a particular hot spot in the pan since it took almost twice as long to get to temperature this time. I did think it was a bit quick the first time. Anyway, you will be pleased to know that it was me and not the recipe Kate! Thank you Kate. I made this and it was great.